Kisah Jika - Story of Ifs: Twentysomething Response 1: Twixter - A disorder, lame excuse or the norm? Twentysomething Response 1: Twixter - A disorder, lame excuse or the norm? For the past few months I have become hyper aware of people who experience prolonged adolescence. No, they don't stay seventeen forever, but they do, often, exhibit behaviors and social tendencies that are more regularly shown in teenagers. 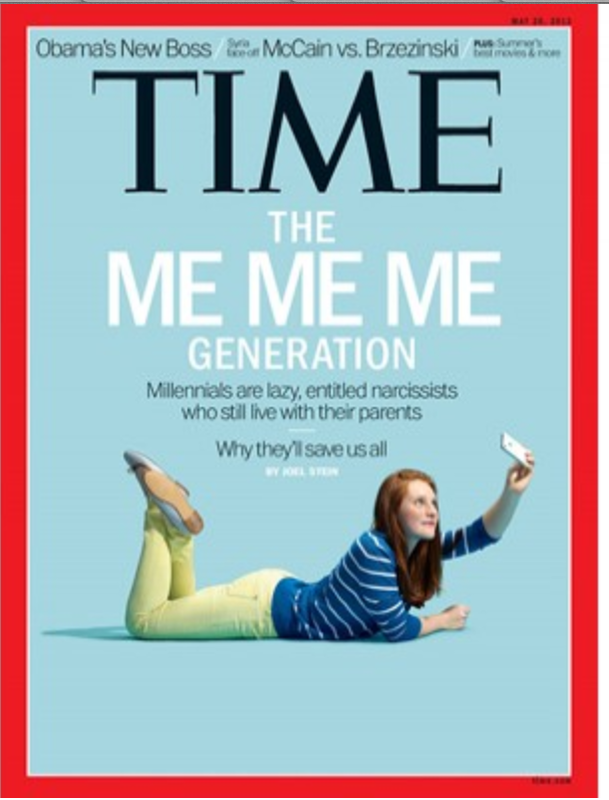 Recently Time Magazine (May 9, 2013) placed Millennials at the center of its issue. Funnily, based on the article, the so-called Me, Me, Me Generation would highly approve the attention they received. Joel Stein, the writer of said Time Magazine article, wrote "The incidence of narcissistic personality disorder is nearly three times as high for people in their 20s as for the generation that's now 65 or older, according to the National Institutes of Health; 58% more college students scored higher on a narcissism scale in 2009 than in 1982" (Time Magazine, May 9, 2013, 28). What do the figures mean? Is that a positive or negative finding? Should I be ashamed for being part of this group? Stein describes my generation as self-promoters, fame-obsessed, entitled, narcissistic, and stunted. Millennials, who are often categorized as people born between 1980 and 2000, are so convinced of their greatness that we rarely hesitate to sell ourselves for fame. Famous or infamous millennials include Lady Gaga, Mark Zuckerberg, and the Harry Potter kids. YouTube sensations such as Sammi Maria and Michelle Phan are also part of the assembly. Also called the Peter Pan generation, my generation is stunted developmentally. We either experience or are doomed to go through a prolonged life stage between teenager and adult. Those stuck in between are sometimes called twixters or emerging adults. To answer the title question, being a twixter is not a disorder; it could be a lame excuse, depending on who you ask; and it is apparently the norm. According to Stein, this is caused by a longer experience of peer-pressure, which has been associated with lowered intellect and eloquence. As a member of the Millennial generation, I naturally agreed and disagreed with Stein's observation. He quoted Mark Bauerlein, an English professor at Emory, who characterized peer-pressure as anti-intellectual, anti-historical, and anti-eloquence. As an only child and the only girl amongst my cousins, I usually sit with adults during dinner parties. On long school holidays, my mom brought me to work where I observed adults working, stressing out over deadlines, gossiping about each other, and breaking down due to their boss's temper. At school, I was highly attached to my teacher, as I regularly spent recess in their office. Basically, I was never fully felt comfortable spending time with my peer. As a result, I know more about teen TV shows from the 80s than current ones. Unlike most of my friends who spent time with each other and their siblings, I excelled in formal events, internships, office meetings, interviews, and one-on-one time with professors. This might have to do with knowledge dissemination, which most often occurs from older people to those who are younger. I definitely learned much more about history, ways to avoid mistakes, resilience, and manners from my "old" friends. There's a saying in Indonesian, "Orang buta nuntun orang yang juga buta," which sort of translates to "A blind person directing another blind person". Two people of the same age could enrich each other, but there would be much more knowledge to pass from those older to those younger. Between agreements and disagreements there comes confused lip-biting. As I sit in the toilet rereading the article, I can't decide where I stand when it comes to self-promotion. On some level, more and more Millennials begin to self-brand and sell oneself as the primary product. Most of us were brought up to realize how special we are and how great of a milestone we've just made. However, I am certain that not all Millennials have the confidence to ask for a promotion or raise every two years without taking into his/her performance. Many of my friends, actually, lack the self-assurance to encourage others to hire them or grant them other opportunities. Although this blog is one indicator of the ability to self promote, I have yet learned how to take a selfie worth posting. But there are definitely members of the generation who thrive on self-promotion, especially with the existence of Twitter, Instagram and YouTube. Two of my friends in college have girls or followers coming to their on-campus shows based on the contents of their Tumblr. Self-promotion is an iffy subject, often displayed in extremes. A salient point made by Stein is that Millennials do not need help from other generations, which might account for why older people are afraid of us. I highly disagree with this statement. To some degree, we are more resilient to financial crashes and high unemployment rates, in part due to our ability to self-promote and the presence of mediums to profit from these activities. However, not all Millennials succeed in selling themselves, many fail to stay cool on social media sites when confronted by haters. In addition, we may be under great influence by our friends, however we are also highly affected by our parents. We are one of the most highly surveilled generations in modern society. No one really knows what to do when left alone, perhaps because with the presence of virtual reality we are essentially never alone. Members of Generation Me, Me, Me require the attention of the public and constant validation, therefore we still need people from other generations. At the end of the day, not all of us will make it as start-up founders or YouTube stars, many will have to work "conventional" jobs, controlled by members of the Generation X or Baby Boomers. Stein's article definitely lit a flame in numerous readers. It is relevant, salient and directly applicable, in some cases. However, it is an observation that is yet to end. Many Millennials have yet graduate middle school, let alone joined the workforce. We have yet to see what Generation Me, Me, Me will become. As a member, I am psyched to see the results and hear responses from members of older and younger generations.